The free webinar, “Unlocking Financial Statements,” was originally held May 14-18, 2012. 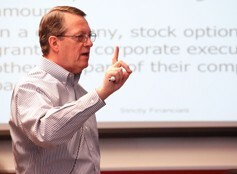 Jimmy Gentry, award-winning professor at the University of Kansas, continues the popular, weeklong training with tips for analyzing corporate financial statements. This free webinar was also offered in 2011 and 2010. Jimmy Gentry presents during the 2012 Strictly Financials Seminar. This seminar will be led by James Gentry, a professor and former dean at the School of Journalism and Mass Communications at the University of Kansas. He has presented workshops on understanding the numbers of business to thousands of journalists and corporate communicators. Prior to joining KU, he was journalism dean at University of Nevada, Reno, and associate professor at the Missouri School of Journalism. Take a look through the resources below. At your own pace, you can walk through the self-guided lesson on finding stories in financial statements.